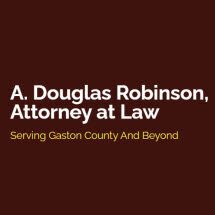 Based in Gastonia, North Carolina, A. Douglas Robinson, Attorney at Law serves Gaston County and the surrounding area. Our law firm focuses on civil litigation, real estate law and landlord-tenant issues. We provide diligent advocacy and pursue the best possible results for our clients. Our law firm is led by A. Douglas Robinson, a Gastonia native who has been in legal practice for more than 20 years. Mr. Robinson prides himself on providing attentive, one-on-one counsel. At every stage of litigation, he lays out all of the options for his clients. Mr. Robinson is a Gastonia native. He understands the legal landscape in Gaston County and the surrounding area. He uses his knowledge of the local courts and other attorneys to strengthen his clients’ positions. Mr. Robinson is a licensed mediator, and he brings high-level negotiation skills to his clients’ cases. Litigation is a constant process of negotiation and he strives to reach negotiated agreements. When that is not possible, he takes disputes to court in order to represent his clients’ best interests. Mr. Robinson graduated from Haverford College in 1992. He earned his law degree from The University of North Carolina at Chapel Hill in 1995. He also studied at University of Oxford in England. As a law firm that focuses on civil litigation, we advocate forcefully and skillfully for our clients in the courtroom and in written arguments. We thoroughly research our legal arguments and examine the issues from every possible angle. Our firm is well-versed in landlord-tenant law for commercial and residential buildings, and we have successfully represented both landlords and tenants. In real estate disputes, we have provided counsel on a wide variety of cases. Whether you need counsel for civil litigation, real estate or landlord-tenant law, you will benefit from the personal attention and experience we bring to your case.